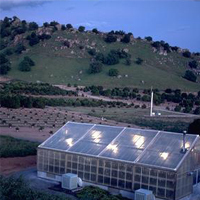 San Joaquin Valley citrus growers and the University of California Riverside established the Lindcove Research and Extension Center in 1959. The soils and climate at LREC are representative of the 190,000 acres of commercial citrus growing in the Central Valley of California. Scientists conduct research programs at LREC that evaluate new varieties of citrus, better ways to grow citrus, and new ways to manage pests. Extension programs communicate the results to citrus clientele as well as the general public. The station consists of 175 acres located at the 500-foot elevation next to the foothills of the Sierra Nevada mountains. The climate is Mediterranean with mild winters and hot, dry summers (May-September), with temperature extremes from the low 20's to 110oF. Usual annual precipitation is 13" with prolonged tule fog episodes during December and January. Continuous recording of weather information has been maintained since 1962. San Joaquin sandy loam is the dominant soil type.